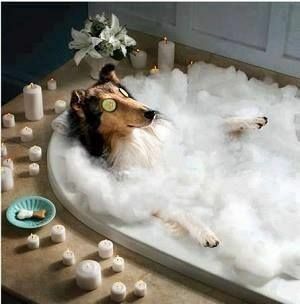 Does your dog need a bath, brush out and nail trim (BBN)? We can absolutely help you with that. We'll pamper your pet by first brushing to remove excess hair and get out any tangles, followed by a nail trim. Next we'll lather them up using only high quality shampoo to clean and condition your dog's coat, followed by a thorough rinse. We do offering furminator solution for an additional cost. After the bath is done, we'll brush and blow-dry your 4-legged friend and prepare her for your arrival. You may ask to have this done on the last day of your pets boarding stay or drop them so we can spend the day pampering them. Pricing depends on size and hair coat, please contact us for an estimate. NOTE: we currently do not have a professional groomer on staff, so we cannot offer haircuts at this time. We also do not bathe cats.